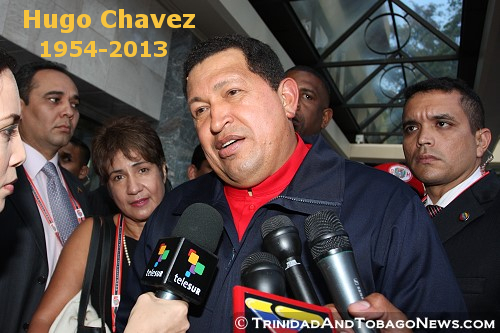 Published on March 5, 2013 in 5th Summit, General T&T, International, Latin America, Passed on and Venezuela. 7 Comments Tags: Fifth Summit of the Americas, Hugo Chávez. Vice President of Venezuela Nicolas Maduro announced on Venezuela’s television that Hugo Chavez passed away on Tuesday afternoon at around 4:25 p.m. after a two year battle with cancer. He was 58. Since coming into power 14 years ago, Chavez embarked on a socialistic revolution that saw sweeping changes across Venezuela. Published on March 5, 2013 in International, Latin America, Passed on, Politics and Venezuela. 12 Comments Tags: Hugo Chávez.